The twin volcanic island of Ometepe is firmly on most Nicaragua itineraries and for good reason. 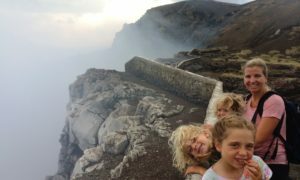 It is a great place to visit in Nicaragua with kids as there are so many great activities to explore. 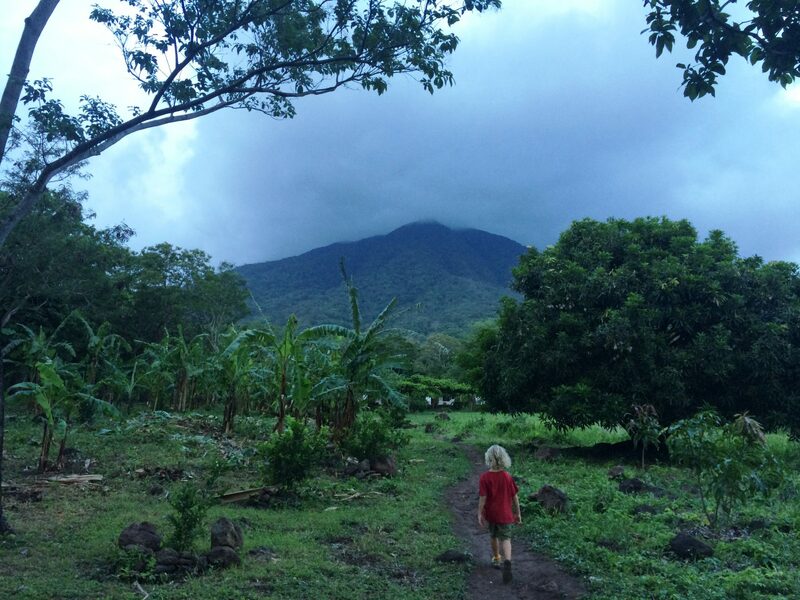 If you are only visiting Nicaragua for a week, Granada and Ometepe should be on your route. 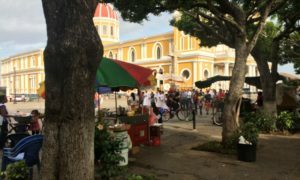 Check out our list of Nicaragua itineraries here. 4.0.1 Enjoyed Reading this Post? SIGN UP for more. After getting around by taxi on our first couple of trips around, we realized we needed to break into the chicken bus mode of travel. Popular all through Central America these are old American pimped up school buses are cheap, easy to use and traveling with the locals is way more interesting. We love that they post the fare at the front of the bus and never try to rip you off (as we encountered often in Vietnam taking local transport). 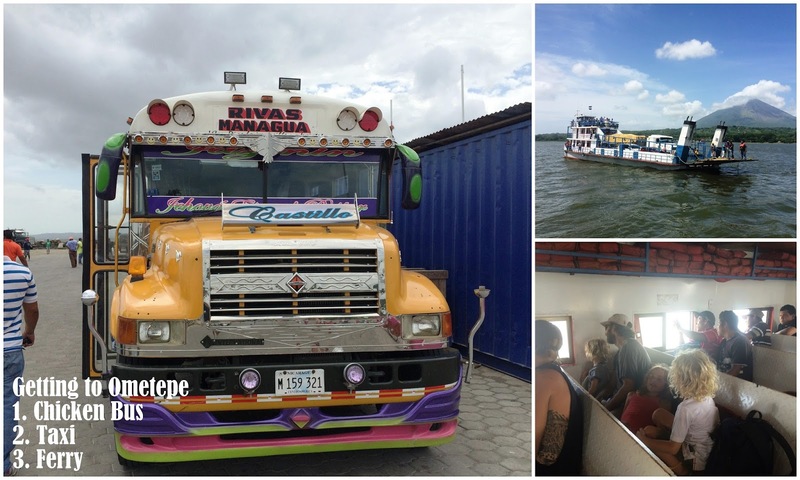 To get to Ometepe on Lake Nicaragua, we needed to take a chicken bus, a short taxi to the ferry dock and a dodgy ferry (that the guidebooks assure is perfectly safe). Lake Nicaragua is the largest freshwater lake in Central America and there were whitecaps on the lake making the hour long ferry a bit uncomfortable for the seasick prone in our family. But we were prepared with Gravol and everyone survived the ferry without losing their lunch. The controversial Nicaragua Canal is set to turn Lake Nicaragua into a major shipping channel connecting the Atlantic and Pacific, to be able to compete with the Panama Canal. Since Lake Nicaragua is the biggest source of freshwater in Nicaragua, this is a huge concern for people here. The contract has been awarded to the Chinese and many question if the economic benefits will overcome the environmental risks. We were headed to the most remote part of the island Merida and opted again for a taxi right to our guesthouse. We stayed at lovely guesthouse on a small farm (Finca Mystica) owned by an American family. As we arrived the howler monkeys were there to greet us, right above us as we stepped out of the taxi. I would have expected howler monkey to howl, like maybe a coyote or something. But they sound like really loud cows or pigs. We tried not to get too close because a friend we met at La Mariposa had monkey feces thrown at him, ending up all over his face. Isn’t it great when you don’t have to seek out the wildlife, it just comes to you! 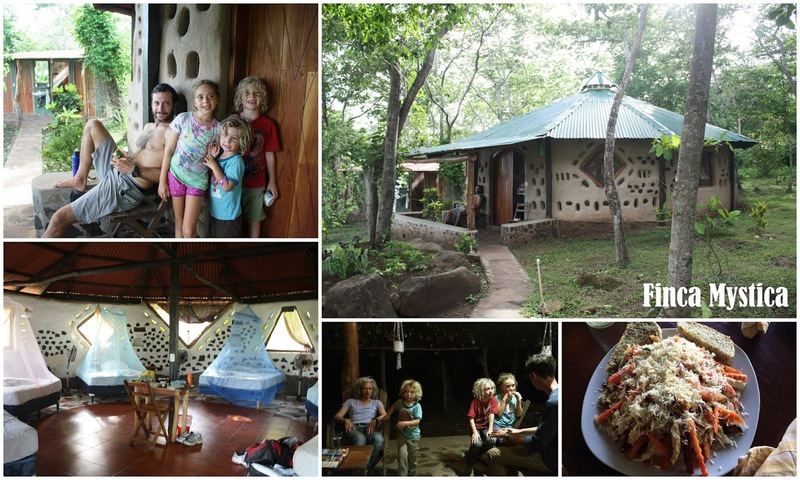 We stayed in a cute little cabin made using cob construction methods and ate like kings while we were there with the most amazing food. 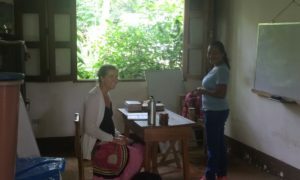 It wasn’t typical Nicaraguan rice and beans, but things like banana chia pancakes and chicken curry – yum! The lovely gardens and fruit trees attracted so many butterflies…it was like being at a Butterfly Conservation – they were everywhere. Patti enjoyed watching the dragon fruit flower (which they only did at night). We met lots more interesting travelers; I forget how special it is to hear everyone’s stories – the best part of traveling. 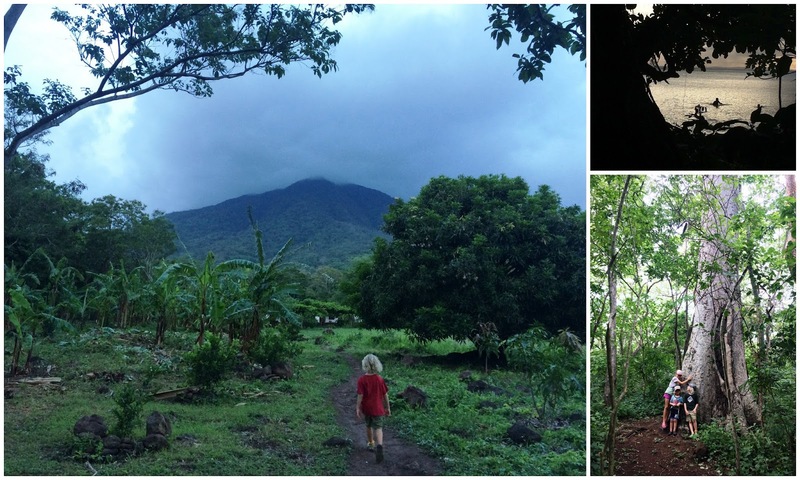 Ometepe is rural Nicaragua that is just starting to really open up to tourism, which is still mostly backpacking travelers. The homes are simple and small, many made out of bamboo and thatch, without running water and the smell of cooking fires permeated the air. In the morning, the women would work on island tables in the lake that were set up to wash their laundry on washboards. I am always humbled to see such a simple way of life and wonder how I won the lottery of wealth in being born in a developed country. The scenery on Ometepe is quite spectacular with the twin volcanoes rising up from the Lake, with the tops generally shrouded in clouds. It is a popular trek to climb either volcano, although it is an 8-11 hours trip, so not for us. We could have spent our days lounging around the hammocks of the beautiful Finca with the Volcan Merida and the Lake as our backdrop, and we did do plenty of lounging, but we also had some activities we wanted to do. We hiked to a waterfall one day and just as we reached the waterfall the skies opened up and the rain pored down. So much for cooling down in the waterfall; we had our own waterfall! 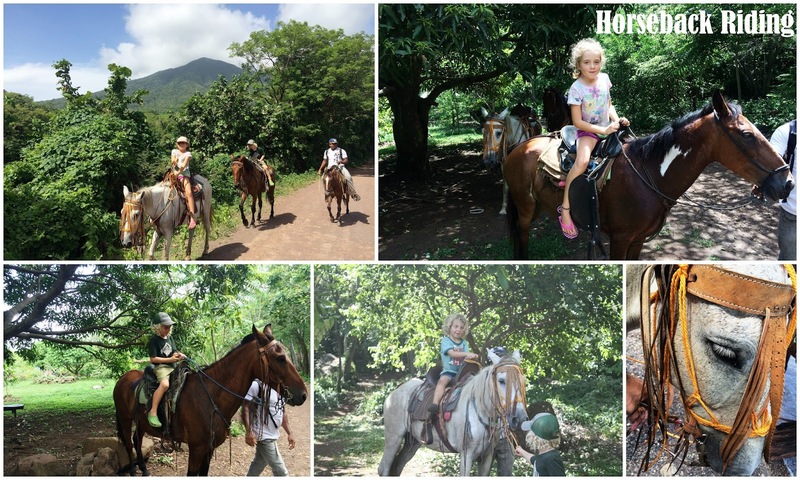 The kids rode horses one day, something Ella had really wanted to do. She was a bit nervous having only been on a horse a couple of times, but got more confident as the ride went on. Gavin who had never been on a horse, went off like he had been riding forever. Even Miles got to go for a little spin around. You have to love doing things like riding in a developing country – no waivers, no helmets! 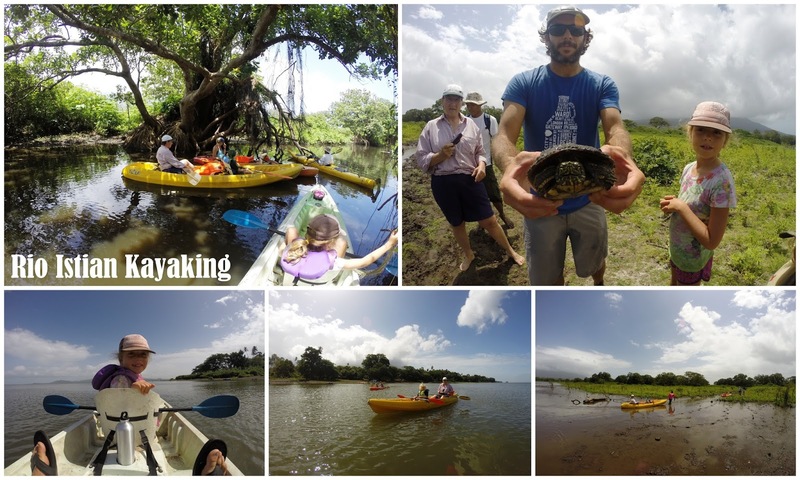 We also did a kayak trip, starting on the Lake and going towards the Rio Istian. Although it is the beginning of the wet season here, they have had very little rain and the Rio was very shallow. 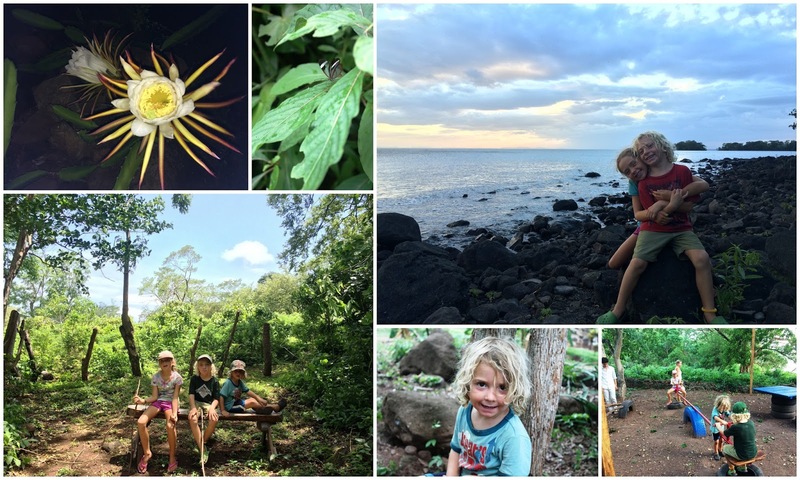 Wildlife viewing also isn’t the best with three young kids, but we managed to spot many different types of birds. The paddle on the Lake into a really strong headwind was quite the workout and we were really glad to finally reach the Rio. 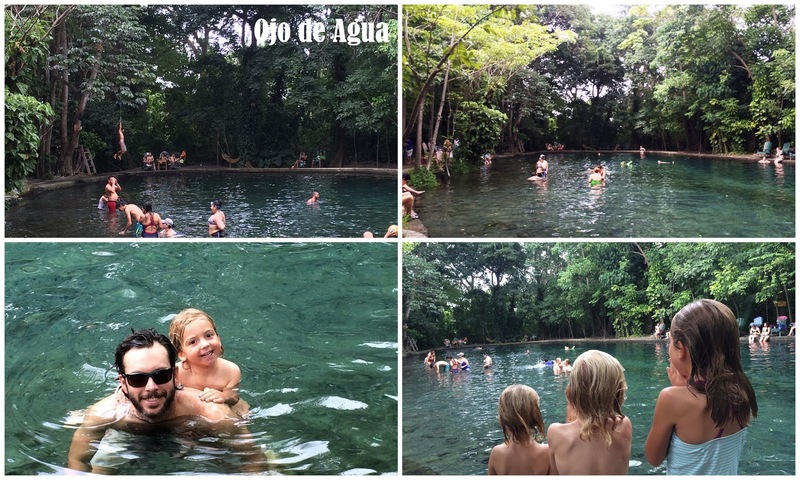 On our last day on Ometepe, we saw some of the island’s petroglyphs and visited Ojo de Agua, a natural swimming pool, for a refreshing afternoon. From Ometepe we had to decide where we were headed next. 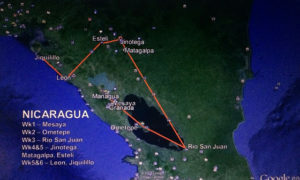 We were interested in going to the Rio San Juan which connects Lake Nicaragua to the Caribbean, but it involved taking an overnight ferry where you sleep out on deck. In the end, we decided to skip that part of the trip and opted to head to the Pacific beach for a few days. My aunt Patti left us on Ometepe to fly back to Canada and it was great to have her with us for the past two weeks. Caballito’s Mar, stayed here one night after our kayak trip, very basic. $20 for a room with a double and bunk beds. Finca el Porvenir, stayed just one night. 1087C/room. Lovely grounds and nice rooms although the place was empty. Food was more expensive and only okay and it a bit of a walk into Santa Cruz. They do have petroglyphs that you can walk around and view. San Ramon waterfall – we paid to have Hirow, the manager at Finca Mystica drive us to the entrance and then up the road ($30). We then walked the rest of the way. Rio Istian Kayaking with Caballito’s Mar. $20pp, kids free (double kayaks). It can be strenuous kayaking against the wind on the lake. Water levels were low and we didn’t see a lot of wildlife and although the guide was friendly, he wasn’t terribly informative. But still a really fun trip. Ojo de Agua – lovely natural swimming pool. 80C/adults, kids free. Food they sell is more expensive and only okay. We took the chicken bus from Santa Cruz and walked the 1.5km up the road. Where we ate: mostly at where we stayed. Finca Mystica has unbelievable food! 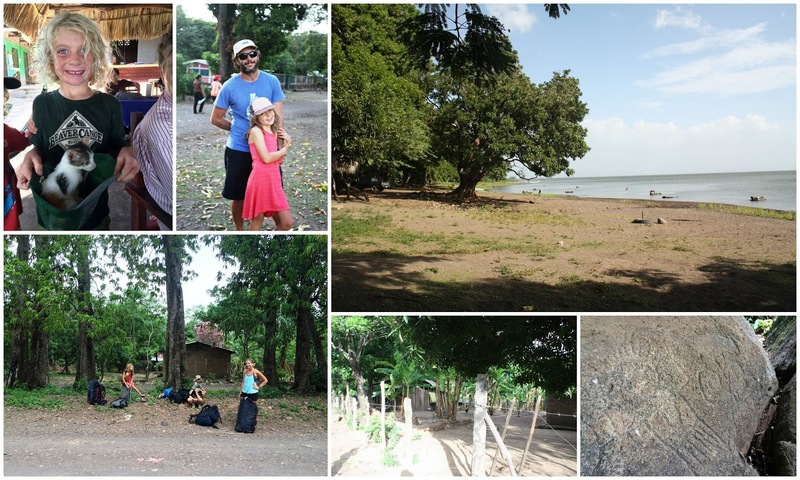 Getting to Ometepe from Grenada – bus to Rivas (leaves from Shell Station), 185C/family, Taxi to San Jorge 110C, Ferry to Moyogalpa 250C/family. Took taxi to Finca Mystica $30.